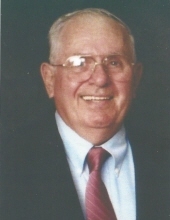 Celebrating the life of James E. Whitford Sr.
Obituary for James E. Whitford Sr.
James E. Whitford Sr., 86, of Weston, Ohio passed away March 31, 2019. He was born May 15, 1932 in Syracuse, New York to Floyd and Cathryn (Matteson) Whitford. He married Velma Marihugh on May 17, 1969 and she survives in Weston. James served his country proudly in the United States Army from 1952-1954. He was a member of the Weston United Methodist Church. He enjoyed drag racing, animals and listening to music. Along with his wife of nearly 50 years, Velma, James is survived by his children James Whitford Jr. of Bowling Green, Ohio, David Whitford of Rogers City, Michigan, Vilinda Poore of West Plains, Missouri, Cathy Killion of Defiance, Ohio, Barb Gustwiller of Weston, Ohio, Tammy Sanford of West Plains , Missouri, Debbie Harris of Michigan, Evelyn Wheeler of Hicksville, Ohio, Selena Nelson of Napoleon, Ohio Lillian Hudson of Townsend, Georgia and Kim Belcher of Perrysburg, Ohio, step-children George Hessler, Curtis Hessler of Vero Beach, Florida and Harold Hessler of Sandusky, Ohio. He is also survived by his sister Alice Young of McClure, Ohio, 36 grandchildren, 70 great-grandchildren and 10 great-great-grandchildren. He was preceded in death by step-son John Hessler, brothers William Whitford and Robert Whitford and sisters Sharon Wiener and Sue Bunger. A Celebration of Life Service will be held on Wednesday April 3, 2019 at 11:00 a.m. at Weston United Methodist Church, 13185 Maple St. Weston, Ohio 43569. Pastor Boyd Shugert will officiate. Visitation will be held Wednesday morning at the church from 10:00 a.m. until the time of the service at 11:00 a.m. Funeral arrangements have been entrusted to Dunn Funeral Home in Bowling Green. Memorial contributions may be given in his memory to the American Heart Association or the Wood County Humane Society. To send flowers or a remembrance gift to the family of James E. Whitford Sr., please visit our Tribute Store. "Email Address" would like to share the life celebration of James E. Whitford Sr.. Click on the "link" to go to share a favorite memory or leave a condolence message for the family.